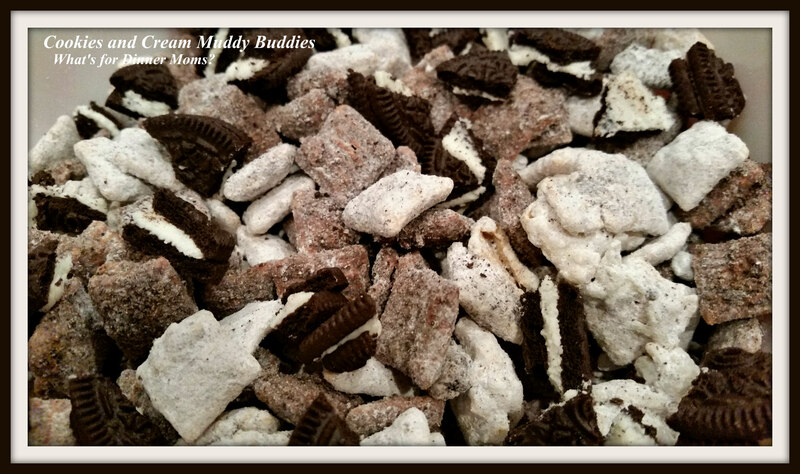 Cookies and Cream Muddy Buddies – What's for Dinner Moms? If you haven’t visited my blog in a while you should! I am coming up on my 4 year anniversary of writing this blog (though I really don’t count the first year and a half). I decided it was time to shake things up a bit with a new design, larger font and hopefully easier navigation, once the site is entirely up and running. Things are being moved around to make it easier you to find your favorite dishes. There will be a Recipe tab at the top to link to certain categories such as appetizers, casseroles, slow cooker meals, etc… There will be a Disney tab for all my favorite information on Walt Disney World. For now those are not completely linked but should be soon. You can still find all your favorite categories and posts at the bottom of the page right now. If you click on the desserts category you will see there aren’t too many there. I am not a fan of desserts and sweets. Really. A nice piece of a really good chocolate cake once in a while or a square of dark salted chocolate are my choices on the rare times I want something sweet to eat. The rest of my family on the other hand…. I cannot keep ice cream or other treats in the house because they are gone in hours, not days, hours. My daughter has been going through Pinterst lately and looking at all the types of Chex Mix she can make. I told her she could pick one to try. She really wanted to make Cookies and Cream Muddy Buddies. I ate one bite of this and that was more than enough for me. If how quickly it disappeared is any indication it was REALLY good. She in fact ended up making two batches of this. It was simple enough for her to make with the microwave but left several bowl for her to rinse and put in the dishwasher. Divide the Chex cereal into two bowls with 3 cups in each bowl. Crush Oreos to fine crumbs in a food processor or using a rolling-pin and a gallon bag. Once Oreos are crushed divide the crumbs between two one gallon storage bags, it will be about 1/2 cup per bag. Then add 1/2 cup of powdered sugar to each bag. Melt the chocolate chips in the microwave stirring every 10 seconds until melted. Pour the melted chocolate over one of the bowls of cereal and stir well to coat completely with chocolate. Melt the white chocolate chips in the microwave stirring every 10 seconds until melted. Pour the melted chocolate over the remaining bowl of cereal and stir well to coat the cereal completely with chocolate. Add the milk chocolate coated cereal to one of the bags of crushed Oreos and shake to coat completely. Add the white chocolate coated cereal to the remaining bag of crushed Oreos and shake to coat completely. Add both bags of cereal to a large bowl alternating from each bag to mix. Add roughly chopped Oreos to the bowl for extra chocolate flavor! I’ll definitely have to make this with my kiddo’s! It is fun crushing Oreos with a rolling pin. What an incredible twist on muddy buddies, Marci! When I first saw your the main photo it reminded me of winter…not sure why, but this is a perfect snowy day treat! My daughter loved making them and eating them! Hope she does if you make it! Thank you! Hope you find something you like! WOW! This sounds pretty amazing. Thank you! My daughter did a great job. My 15 year-old daughter made it without any assistance. It really is easy! Yummy! My nephews would love these! But could you use another cereal other than Chex as I don’t think you get these in the UK. These are a corn based square. Any equivalent would probably be fine.